Health and Safety is at the core of everything we do and are committed to providing and maintaining a healthy and safe workplace. Our goal is to carry out our work with zero harm to people and property, promote good health amongst our staff and contractors by implementing policies and encouraging practices that promote healthy lifestyles and behavior for each individual employed by the organisation. We recognize that our work involves risks, but we believe that we can control and mitigate these risks if they are managed properly through a robust health and safety management system. Our senior management has pledged its accountability for our health and safety performance. If incidents occur, we share the lessons learned to avoid reoccurrence and to improve our practices. 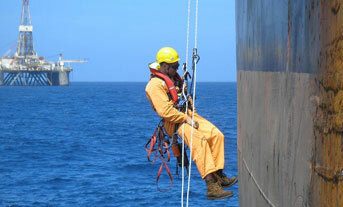 We strive through training, communication, and our Health & Safety Policy to create a health and safety culture where everyone takes responsibility for their own safety and for the safety of others and we believe that, ultimately, every EM&I employee has a role to play in maintaining and promoting a healthy and safe work environment. EM&I is committed to delivering the highest quality service. This is achieved through having the experience to understand our Clients’ needs, a documented and extensive management system and dedication to continuous improvement. We measure our Quality Performance through regular Stewardship Reviews, FPAL feedback and internal audits. Our Quality Management System is accredited to ISO 9001:2008 whose standards we are committed to meet and indeed, exceed. We recognize the importance of suppliers and work with them to improve the quality of the services they provide to us. We are also accredited to ISO 17020/17025 which confirms our capability to act as an independent inspection authority. In addition we also meet all statutory requirements, and consider the effect our actions have on the environment and public. EM&I are committed to the care of the environment and the prevention of pollution. We ensure that all our activities are carried out in conformance with the relevant environmental legislation and seeks to encourage sustainability by minimising waste, promoting recycling, reducing energy consumption, reducing harmful emissions and by working with suppliers who have sound environmental policies. An essential feature of the EM&I Environmental Management System is a commitment to improving environmental performance by setting annual environmental improvement objectives and targets, which are regularly monitored and reviewed. In particular EM&I recognise any activities within our business that may have an impact on the environment and take steps to identify the correct work processes and procedures to work within recognised industry guidelines, and to take reasonable steps to reduce any further impact, to the minimum practicable levels.